48:46:12. That’s the amount of time it took for me to complete Final Fantasy XIII. After waiting over 3 and 1/2 years for the game to release, was it worth it? Did it live up to the hype? Well… yes and no. As a whole I would say I did enjoy the game, but there were several things that definitely keep it from being one of the best in the series. If you’re expecting something epic and amazing… don’t. The story is the weakest part of the entire game. In the beginning you get a sense that it could go somewhere, but it really doesn’t. It’s very simple and straightforward, which I suppose makes sense as the game is divided into 13 chapters presented in a more cinematic way. The game definitely feels more like a cinematic action game rather than a typical RPG. The main problem is that for the first 10 chapters you’re presented with several plot devices that eventually just become irrelevant to a much bigger idea that never really gets expanded upon. Everything you know from press materials and trailers is wrong. Along with story issues was the pacing of it all. The first 10 chapters of the game can be completed in 20 hours or so. That leaves chapters 11-13 taking up the bulk of the game at around 30+ hours of game time depending on how many of the Pulse-based missions you choose to complete before advancing the story. To put it simply, it’s broken and contributes to the collapse of the plot about half way through. Even though the story and pacing were weak, the characters did end up being at least tolerable… save one. I really came to hate Snow from the beginning of the game all the way through the end. He really is the most cliche, overly-shounen hero-complex character in the game with the most ridiculous lines out of anyone. It doesn’t help that through out the game, you’re forced to use specific characters for each chapter through chapter 9… so you get stuck using characters you may not like, like Snow. Once you were able to choose your party set up — about 20 hours into the game — I never used him again. Most useless character ever. Everyone else was fine though. My main party ended up being Lightning/Vanille/Hope just because I seemed to like them the most, along with Fang switched out for Lightning sometimes. The individual character developments were okay, but at a certain point you realize who the true main character is, and I think I had a lot more appreciation for them once that happened. Not to spoil, but you’ll definitely see what I mean if you get to the end. If the story is the weakest part of the game, then the battle system is definitely the strongest. Using a more streamlined ATB system, XIII’s battles are the fastest in the series. The best part is the real time ‘role switching’ or Optima Change system. Being able to instantly change set jobs to fit different situations creates more interesting and fast paced fights. It’s flashy, it’s exciting, it’s fun. The battle system is not without its flaws though. The one thing that irritated me the most about it was the complete reliance on the party leader. Like in the Persona series, if your party leader dies, regardless if the other members live, you game over. Even though you’re allowed to restart battles as many times as you want, it still can be very frustrating, especially on later boss fights. There were several times that it became almost a game-breaking inconvenience to me. I wish there was some sort of real-time party member and leader switch-out such as Final Fantasy X and XII had. The other issue I had ties in a little with the party leader based control: limited AI control. Within the Optima Change system you can set each character to specific roles, but you cannot set priorities within each role. For example, say I set one character to the Enhancer role which consists of abilities such as Haste, Shell, etc. Instead of automatically casting Haste at the beginning of the battle, you sometimes have to wait until several other buffs have been cast. But I wanted Haste first… too bad, you can’t do anything about it. The ‘leveling system’ or Crystarium is what you use to give your characters new skills and magic/attack/defense up. Completing battles gives you Crystarium Points which you spend on such things. It’s very similar to the Sphere Grid from Final Fantasy X with some differences. The Crystarium is capped through out the entire story and levels are only unlocked after certain chapters are completed. This ensures you cannot over-level past a certain point. The maximum level is only unlocked after completion of the final boss as well. In addition, each character is limited to three specific roles until about half way through the game. For example, Lightning starts off with Attacker, Blaster, and Healer, while Hope starts off with Blaster, Enhancer, and Healer. Every character is different and has slight strengths based on their pre-set roles. Later on, everyone can learn the other three roles but the CP cost is ridiculous. I left summons for the end here because they really aren’t all that important. In fact you can probably go through the entire game without using them. In the long run they just don’t do a lot of damage if your characters are leveled up enough with decent weapons. Sure, you get to fight them in order to obtain them, but even then those battles are hardly difficult. Basically, they’re good if you need saving during a boss fight, otherwise, they feel useless and almost tacked-on. Controls in the game are fairly straightforward. You use the analog stick to control the character on the field and face buttons and directional pad in menus. During battle you also only use directional pad and face buttons to select attacks. Optimas are chosen with L1 and then selected up or down with the d-pad. The only time analog sticks can be used in battle is during the summons driving mode. Unfortunately controls cannot be remapped at all in the menu options. There is also no audio control options for voice and music volumes. Final Fantasy XIII’s soundtrack is fairly good though. I wouldn’t say it’s up there with my favorite Final Fantasy OSTs, but it does the job. A lot of the tracks are very ambient and unobtrusive. Hamauzu makes use of a lot of vocal bgm tracks which are rather interesting. Specifically I liked the battle theme and its variations, Lightning’s and Sazh’s themes, as well as the chocobo tracks. The main theme, Kimi ga Iru Kara isn’t anything special, and thankfully was only present during the end cutscene and end credits. The game has very nice graphics. Not the best looking game out there, but certainly impressive for a Japanese developer. There is no screen tearing, no noticeable frame drops, anti-aliasing… the over-all image quality is very clean. The art direction is absolutely amazing and most of the environments look great save for some low resolution textures here and there. One thing that bothered me was they had three types of models: CG, high quality in-engine, and gameplay. The former two look spectacular, no arguments there… however, a lot of the times they would use the lower poly gameplay models for a good portion of the cutscenes and it would just look bad. Square fingers, etc. 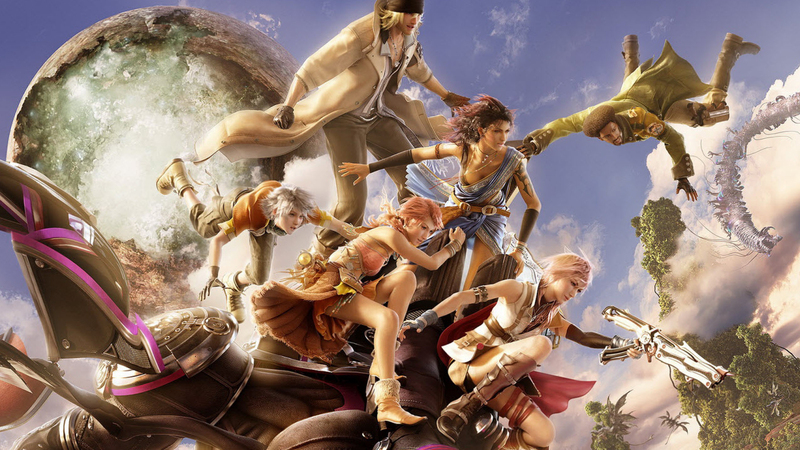 Despite looking and sounding great, the one thing Final Fantasy XIII lacks is a variety of extras. There are no towns. You do all your shopping and weapon upgrading from an ‘on-line shop’ found at all save points. You can’t back track through any of the areas in chapters 1-10 and so a good portion of the game is very linear. The only areas you can go back to is Pulse and Eden and a majority of that is post game if you want to max out the role levels and finish missions as well as secret bosses and whatnot. There are no mini-games. Yes, there are missions you can do, but those consist of the same find enemy, defeat them, go find new mission repetitiveness. There are a couple areas where they theoretically could have done something but… it just didn’t happen. Puzzles aren’t anything special either… consisting of activating a couple switches here and there while defeating enemies in the way of them. Not very exciting. I kept anticipating something more complex and it never came to be. At this point with the main story completed, I’m having a hard time finding the motivation to finish the little they leave you left with. Overall though, Final Fantasy XIII is not perfect, but it’s definitely above average. Not the best Final Fantasy game, but it is still worth playing. Disclaimer: Nova Crystallis purchased & reviewed on a retail PlayStation 3 copy of Final Fantasy XIII imported from Japan. Reviewer is fluent in Japanese. Read more about the Nova Crystallis review policy here. Posted in Final Fantasy XIII, Reviews, Special.